Malden - The Youth A.C.T. members have decided to postpone the Urban Art Competition to Saturday, July 11, with a rain date of Saturday, July 18th. Returning for its second straight year, the Urban Art Competition will provide young artists with a chance to showcase their skills at Lincoln Commons. Toward that end, young artists will compete in a juried contest by creating works on boards over the course of the day. The judges include members of the Malden artistic community, and community groups from the city and beyond have volunteered to provide supplies and entertainment. “People are willing to come together to give their time, energy, money and talent to make things work,” said Du, who is from Malden and a graduate of Malden High School. Her organization, Youth ACT (Activism, Coalition, Trust), is sponsoring the event, with help from many other sources. Supporters this year include Healthy Malden, the First Parish of Malden, Universalist, the YWCA, Asian Spectrum, Friends of Oak Grove, and Malden Access Television. The American Red Cross is also a co-sponsor. The Friends of Oak Grove have donated a PA system for the day, as well as 40 boards for the artists to use. 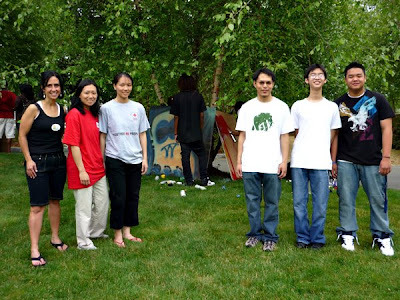 Those who will judge the artwork include artist Sand T, whose work is well known in Malden, muralist James Fox, and representatives of Malden High School and the Malden Cultural Council. Du will also select a youth representative to serve as a judge. Despite so much community representation, Du said that costs have been kept down. “It’s a very low-cost event with a high social value,” she said, noting that the entertainment will be done on a volunteer basis and that co-sponsors have been asked to bring food; youth registrants will also bring food as a potluck. 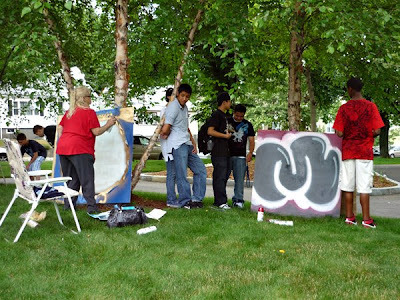 The 2009 Urban Art Competition will take place on Saturday, July 11, 1-5 p.m., at Lincoln Commons, Cross and Bryant streets. The cost to register is $8.